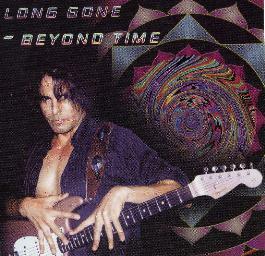 Long Gone - "Beyond Time"
This is the first CD by long standing San Francisco Bay Area musician, Daniel Larson. I reviewed a promo CD of this back in issue 18, of which all the tracks are contained on this full length CD. All the tracks were recorded in Daniel's homemade analog studio. His brother friend plays bass and harmonica on one track. Artwork was provided by Norman Marino, brother of guitarist Frank Marino. The CD begins with the great "Far Beyond This Planet". This track is really a space journey with some fantastic electric space guitar played in the background of an acoustic guitar. If you visit the web page you can find out about each track as Daniel will take you through what was going on in his head during the creation. This is really modern psychedelic space music with influences from Hendrix, Pink Floyd, Ant Bee, Alice's Orb, etc. "Liquid Eyes" is a slow track with a drum machine and mellow laid back vocals and floating guitar. "Clouds Pass By" is a very mellow passionate song with just acoustic guitar and voice. "First Kiss Of The New Century" features beautiful acoustic guitar. "Dark Rain" is a short piece that would be really rocking with a heavy drummer! "10/14/97" is next and features Fred on harmonica. Quite a moving piece with acoustic guitar and harmonica. The previous three tracks have been like space-blues ballads. It is with "Floating Over You" that things start to trip out. A really cool backwards guitar and Syd Barret era Pink Floyd atmosphere is created. The journey lasts over 10 minutes. Brilliant stuff. "Golden Hair", a cover of the Syd Barrett song, is performed next. "Dr. Mars" is next and the electric guitar is back. This is quite a strange but wonderful song. "Prelude To My Death" is a dark deep space song with some fantastic guitar that I am sure Jimi would have loved to hear. "Beyond My Grave" is a more psychedelic trip number with spaced out vocals, strange effects, and sounds. The CD ends with "No More Pain (At Last)". If I have one negative thing to say about the CD, it is the drum machines. I always prefer real drums, I just can't get around my bias. I can understand with home studio projects it is not realistic to set up a drum set in your living room or whatever and it is so much easier to create a beat with a computer. I guess most people are not bothered by this. Just listen to the beautiful, well played, emotional guitar and have a nice journey. Check out the web site for T-shirts and CDs: http://users3.ev1.net/~zap7.